Accredited Slate Roofing Contractor providing expertise for the installation, repair, maintenance, and restoration of Slate Roofs in the San Francisco Bay Area, including Marin County, Napa Valley, Sonoma County, and San Francisco. In October 2016 I had Wedge replace my large roof that was in need, with a new lightweight genuine slate roof. 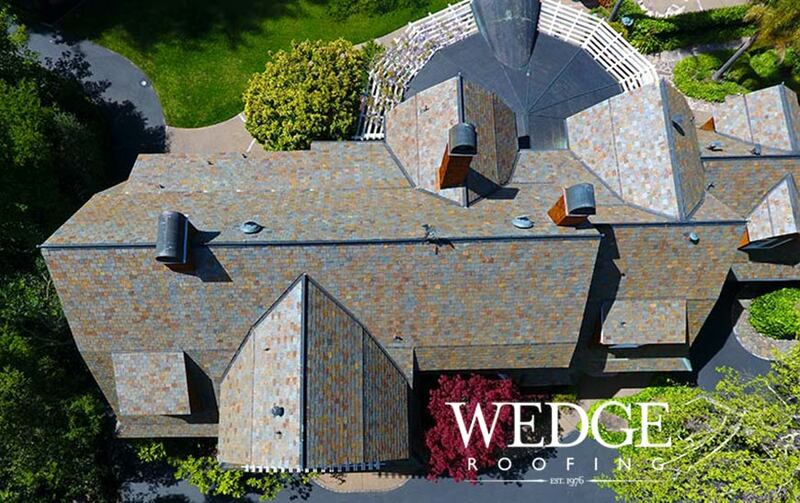 Wedge was chosen after interviewing several roofers, and it turned out to be a great choice!This was a big project that took several months. They did an excellent job in every way. The crew was so polite, hard working, and cleaned up completely every day. Their attention to detail was great. Every single slate is fitted in perfectly, and all the trim looks great as well.The Sales Manager that worked with me was also great, that is Tarry Winfrey. He was in regular communication about every detail as needed, and his taste in choosing colors and material was valuable. In summary, I highly recommend Wedge, and Tarry, and the entire crew. This was a great result and I'm really pleased with them. If you choose Wedge, I'm sure you will be pleased." The enduring beauty of slate roofs in colors ranging from grey, blue-grey, black and various shades of green, purple and red are the pinnacle design feature on many historic buildings. Increased appreciation of long-lasting, environmentally friendly building materials has led to a resurgence in new slate roof installations in the San Francisco Bay Area. Slate, a time-tested, sustainable roof system can be the longest lasting component of your entire structure. The long-life span of slate roofs can minimize the impact on the environment, conserving resources and avoiding repetitive roof replacement. Although considered the highest initial cost point of any roofing material, the longevity and low maintenance of natural slate roofs offers a low cost of ownership in the long term. American Slate offers a wide range of slate roof tiles, known for their quality, strength, durability, fire resistance, water resistance and minimum maintenance. Evergreen Slate Company’s slate tiles are dense, sound rock and exceedingly tough and durable. A slate roof can last a century, giving excellent long-term value, in contrast to other types of manufactured roofing, which must be re-roofed three or four times within the same period. GAF’s TruSlate Premium Roofing System makes the dream of a slate roof an affordable luxury. . I have known Wedge Roofing since 1995 and would very highly recommend them. They have worked on several properties and have always finished on time and within the budget.